Men's From $15 ladies' hair cut $25 B/W From$25 Color Fr.$50 Foils Fr.$50 Treatment under hair steamer Fr.$30 Permanent Straightening Fr.$100 Perm Fr.$60 Special price for seniors Temporary curl and straightening Fr.$30 We give good quality of professional services in reasonable price. 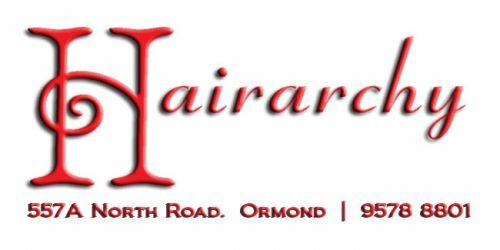 Hairarchy aims to deliver high quality service in a friendly, modern environment. Laura opened Hairarchy in 2009, after beginning her career in hairdressing in 2002. She cares about every client who walks into the salon and trains her staff to do the same. You will receive a high quality service no matter which stylist you see in the salon. Hair is our main focus however we are also qualified in makeup artistry, enabling complete wedding and formal styling. We believe in gaining a full understanding of what a client is looking for with their hair. Helping clients to have great looking hair with a style that suits each individual is our objective. We do encourage healthy hair with our clients and can help you achieve this, through our in-salon products and easy to follow advice. We work hard at maintaining our salon standards, through regular professional training with Wella and De Lorenzo. Your stylist at Hairarchy will be up to date with the latest trends. For more information and photos please visit our website or follow us on Facebook. IT IS ALL ABOUT YOU!!! WHEN YOU LOOK GOOD YOU FEEL GOOD!!!! * YOU (the client) is our first and only priority!! * During your hair services we take as much time as needed to understand exactly what you like to achieve, we will give you the best advise as we can think of and we try to make it as reasonable price as possible. * Our method of working WITH YOU proved itself well abd beyond imagination and we are proud with it. * our Method of working ONLY with one client at a time also proved to be one of the Favorited key point by our clients. * Our home based hair salon proved to be one of the more successful hair places in Melbourne thanks to that approach that become our signature. Specialising in fine hair and foil highlights with over 30 years experiance in Ladies and Mens Hair design.